SOE Ocean Engineering Pte Ltd was established in 2006 and located in Singapore. With over 20 years’ experience, SOE specialist team provide innovative solutions to the offshore oil and gas industry. We offer the complete package – from designing, engineering and procurement, to fabrication and commissioning of offshore and marine equipment and on-site services. 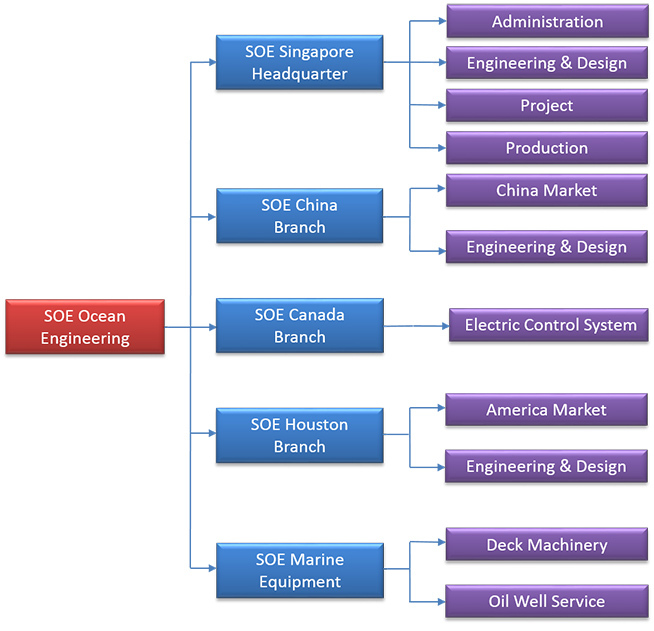 SOE Ocean Engineering has grown dramatically to include branches in China, Canada and Houston. We specialise in the design and manufacture of jacking and fixation systems. Our constant research and investment in the latest technologies allows us to deliver high performance products, tailored to your specific requirements. For all your offshore deck machinery needs, choose SOE Marine Equipment Pte Ltd (a subsidiary of SOE Ocean Engineering). Our specialist division combines research, development, manufacturing and servicing into one entity – producing innovative products that are trusted by shipyards across the world. We understand that our clients are the key to our success. We are committed to deliver cost effective, reliable and satisfactory solutions to our clients. Through close cooperation, we will benefit and grow together. SOE Ocean Engineering will continue to provide innovative solutions that add value to our clients while building lasting relationships with them through excellent customer service, mutual trust and shared purpose. SOE Ocean Engineering provide site evaluation, upgrading, and maintenance services for jacking system and locking system. Site evaluation, upgrading, and maintenance service for jacking system and locking system. Jack up rig/barge/lift boat design analysis and consultant service. Supply of offshore & marine equipment and oil field. Our products are designed and fabricated in accordance with rules or regulations of classification societies such as ABS (American Bureau of Shipping), DNV (Det Norske Veritas), BV(Bureau Veritas), Lloyd’s Register and CCS (China Classification Society). The fabrication process will be under the survey of classification societies to ensure the quality of the products.